As the R&D Incentive deadline looms, companies are reminded that they need to register before 30 April to be eligible to claim for R&D activities for the 2012 financial year. This is the first year the benefits of the new R&D Tax Incentive will be seen. The R&D Tax Incentive (which replaced the R&D Tax Concession), provides generous support for companies who spent over $20,000 on experimental activities in FY2012. Companies with an aggregated turnover of less $20 million could be eligible for a 45% refundable tax offset. There are a few misconceptions surrounding the R&D Tax Incentive that are preventing some companies from considering whether they are eligible. 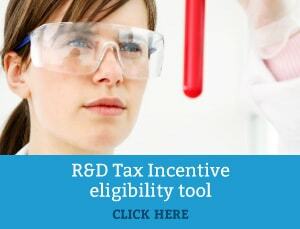 Many people think the R&D Tax Incentive is only available for companies who conduct experiments in labs, however the fact is that experiments are conducted in a wide range of arenas from laboratories, to mine sites, and even office cubicles. You could be creating a new piece of software intended for commercial sale, or developing a new algorithm for a search function, or you could be developing protective clothing for people working in a mine. As long as you are creating a new or improving a product or process, and as a result you are generating new knowledge, you could be eligible for the R&D Tax Incentive. One important thing to keep in mind is that documentation is required to show the process that you went through. It is no longer enough to hold up a new product and say “I created a new product, therefore I must have conducted R&D activities”. AusIndustry require you to show documentation of the process you went through to get there. This could include photos or drawings of the concept, meeting notes, internal emails and documents. As long as you have documents to show that what you created was not ‘an accident’, you should be eligible to claim. If you are still unsure, try our eligibility wizard and find out.